Having analyzed the basic ways of development of the enterprise, the directorate of the company has come to the conclusion about necessity of its reorientation as the sub-contracting organization for construction of industrial objects which are carried out by foreign contractors. 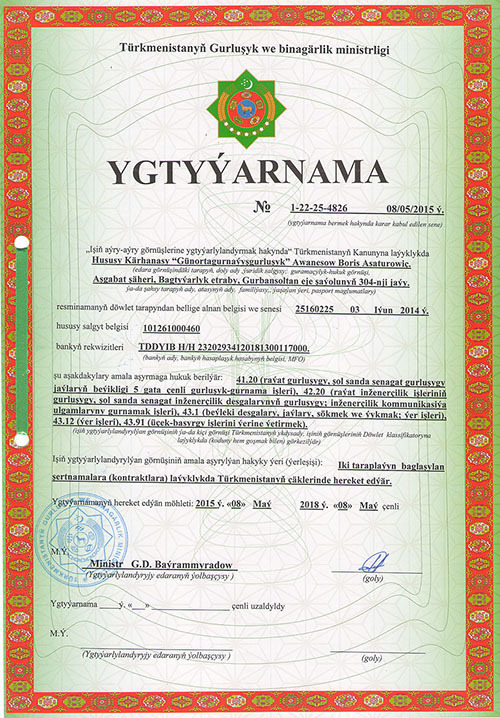 The present kind of activity is the basic one and since 2000 up to the present time our enterprise takes strong position in this segment of construction business of Turkmenistan. 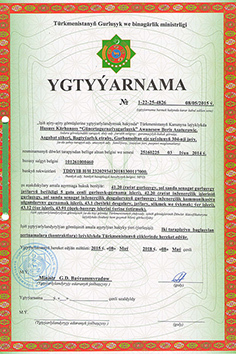 Enterprises was founded as a cooperative society “Motazhnik” in 1989. 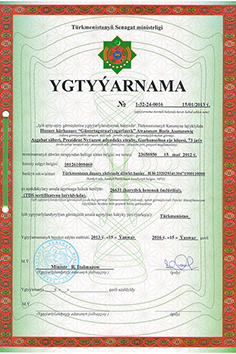 In September of 2001 the Cooperative Society "Montazhnik" has been renamed as the Individual Enterprise "Yugmontazhstroy", and in January of 2003 in connection with translation the name into the state language the firm "Yugmontazhstroy" is renamed as the Individual Enterprise "Gunortagurnayishgurlushyk”. The basic kinds of activity of our enterprise are "Designing and construction of objects of civil and industrial assignment", manufacture of building materials and structures. Now our enterprise consists of two construction management departments completely equipped for independent carrying out of works with an average annual number of 2345 persons for the last three years. Each department includes the full range of machinery, tools and equipment, load-lifting equipment and vehicles, excavators, vibration rollers and platforms, inventory formwork systems and scaffolding, mobile prefabricated office buildings, hostels for the personnel, canteens, laundries, etc. The modern automated concrete batching plants with computer programming. Each department is equipped with modern complex laboratory equipment and has its own staff of laboratory personnel. It allows to conduct regular control of quality of materials used and works carried out at site. Each laboratory is certificated and has appropriate licenses available. Within the framework of the enterprise the department of "Building laboratory and metrology" is established, where monitoring of laboratory equipment and tools condition is carried out. 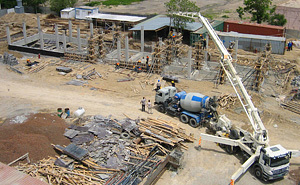 - Building, construction and erection works, repair work, manufacture of building materials and structures. 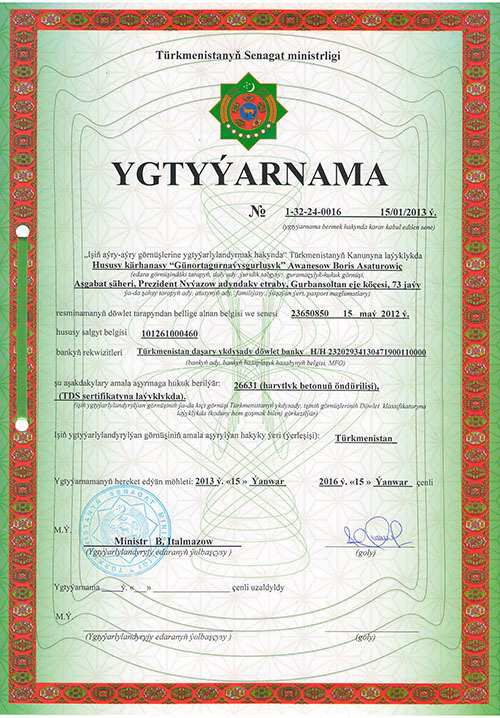 The constant quality control of materials applied in construction works and their compliance with working drawings, construction code of SNiP and GOST of Turkmenistan. 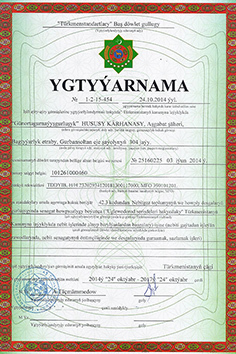 Registration of the engineering specifications accompanying construction, test reports of materials and designs is carried out. 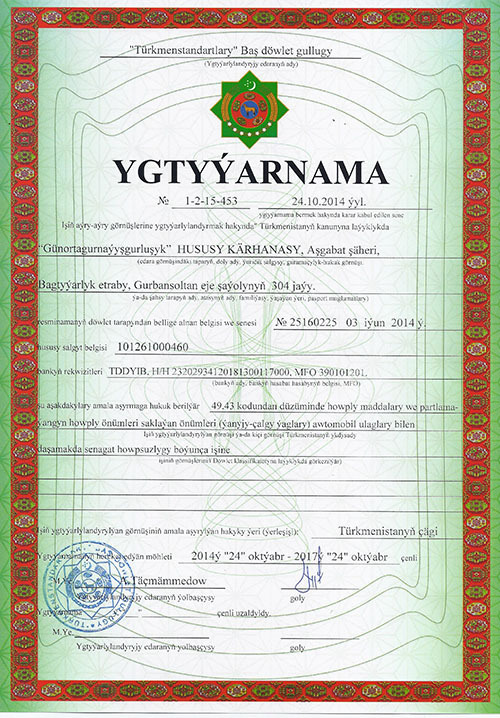 Besides our own laboratory quality control, quality of work process is also supervised by Scientific Research Institute of Seismology of the Ministry of Construction and Building Materials Industry of Turkmenistan. During its activity our enterprise has shown itself as the reliable partner, which is carrying out the obligations undertaken with high -level performance and in due time.